Web to LED | JONAH BRUCKER-COHEN, PH.D. Web to LED – JONAH BRUCKER-COHEN, PH.D.
Hmm. 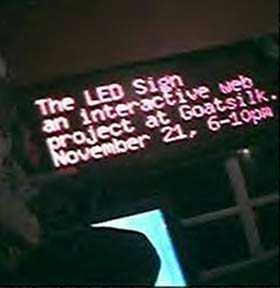 Not too original concept – LED sign in gallery, enter text from the web. Webcam in gallery pointed at LED sign, visitors to the site can read the LED from…….their computers! Umm.. am I missing something here? It’s creators say this – but I think they are missing the point – it’s not enough to simply connect up spaces with words and spit out some theoretical mumbo jumbo about the social importance of the LED sign. What’s the difference between an LED sign and a computer screen displaying a chat in the gallery? Both are displays, both are real-time, and both can be viewed by local and online visitors…. umm nothing new here. hmm. i\’m just stuck on the name \”goatsilk\”. I think your wrong. Big difference between chat board/room and the LED as art show. Redigitization matters. Chat rooms don\’t give off the same effect. No way! Ok – please elaborate on why it matters. I\’m all ears. it sounds from me like your thinking of this from a \”techie\” mentality, a point of view which will prevent digestion of the artistic meanings here. The idea of an electronic leak is exciting, and not equivalent with a chat board. I, for one, am affected by understanding what is happening in the feedback \”loophole\”. Puttting the LED in an art gallery is smart. It highlights, in fact, how very different it is from a typical chat room. Also highlights the current state of the junction b/w spoken language and computer code, physical and cyberspace. I was at opening physically last night…if you could have been there, and watched the sign going off as people from all over the world participated, you might have been able to \”see\” more than you are currently. I know this mentality you express in your comment. I\’ve seen it before. It\’s \”techie,\” not artist. No offense, but to appreciate the LED sign as art show, you have to think a bit more laterally. I agree with you about the techie mentality of my argument, but I think the main reason I say this is because I\’ve seen this project too many times before, in too many different incarnations. I just don’t see how this version breaks any new ground. I also dislike it when artists have to rely on theory speak to make a project seem more abstract than it is (which was I was mostly commenting on in the press release I received). To me the best art has no learning curve – it just makes sense. When you say (btw – who are you? ): \”Putting the LED in an art gallery is smart. It highlights, in fact, how very different it is from a typical chat room. Also highlights the current state of the junction b/w spoken language and computer code, physical and cyberspace.” What do you mean by smart? I have to think you’re forgetting how we interact with computers everyday. We are physical, computers are physical, the internet is “virtual” – but typing on the keyboard is a physical interaction with cyberspace. 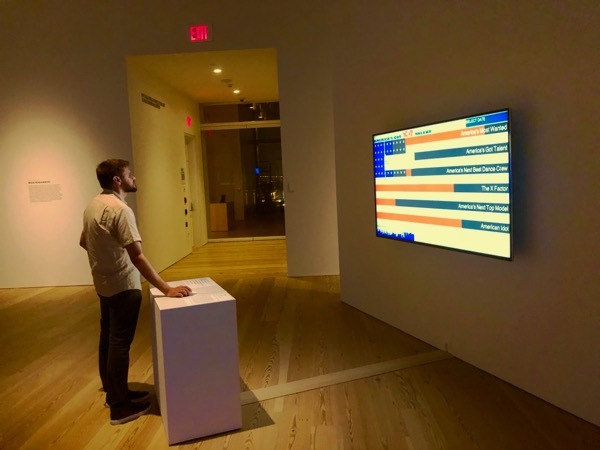 People in the gallery are not interacting with the people online, they are reading a display of messages left by those people. Sorry to rant more, but I think it’s important not to hide behind theory to make art. I find anonymous comments on blogs rather cowardly. If \’name bib\’ feels so strongly about their opinions they shouldn\’t try to hide their identity. Also, I think the requests to attach an identity to my statement is silly. What we say here is much more important than who we are. I take it or leave it as you do. The whole issue of the joys of anonymity and \”self\” expansion are at play on-line. Art like this helps show that. I should mention also that people at the opening weren\’t just watching .. THere were computer terminal in the gallery where physical attendees wrote, and also could be seen beneath the refreshing webcam.